I am excited to announce I will be hosting 4 of them this year. Giveaway Hops are a great opportunity to not only network with other bloggers who likely have blogs that may be of interest to you. But also a fun way to help grow your own blog. We all have our own followers, and if my followers come to enter your giveaway and your followers come to enter my giveaway. So on and so on with however many bloggers we have participating. Well as you can see that is a lot of new eyeballs on your blog. The potential to gain new blog followers is definitely there and well as many more entrants than if you hosted a giveaway on your own. * Need more information, scroll down to see how it all works - OR YOU CAN CLICK HERE TO SIGN UP TO BE NOTIFIED AS SOON AS A NEW GIVEAWAY HOP GOES LIVE. May Giveaway Sign Up for bloggers who would like to participate ends May 2nd. 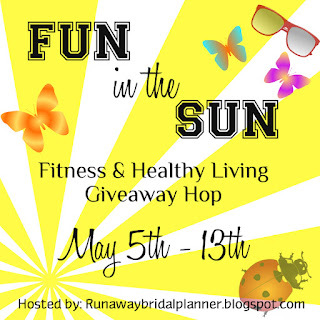 THEME: This will be a Fitness & Healthy Living theme hop. The item you choose to giveaway must fall under a healthy living or fitness type item. VALUE: Giveaway item must have a $10 value to it. You cannot giveaway discount coupons or must purchase to receive type items. DETAILS: Those who sign up early will receive their instruction email for this hop by April 29th. If you need it earlier, just email me! Later sign ups, will receive their's within 24 hours of joining. JOIN: If you have participated before, sign up below. If this is your first time, make sure you scroll down and can comply with all the rules below before adding your name. If you have signed up to participate in the previous giveaway hop, and you did not actually run your giveaway and notify me to withdraw you before the date, I reserve the right to not allow you to participate in this hop. * Your blog must be considered family friendly. In other words safe for any age audience to view. No steamy images, or erotica, and this could even include images in skimpy bikini or workout apparel. As well as keep the language from being obscene. If you question your blogs content email me and I will tell you if it is appropriate or not. If I receive any complaints during the hop, I reserve the right to remove your link from the hop. * The Linky list of all the participating blogs MUST be included at the end of your giveaway post. I will provide you with this at least 5 days before hop starts. * You MUST include the Giveaway image in your giveaway post. This not only helps me know your giveaway was created with this hop in mind. But it also helps all the entrants know they are in the right place. I will also provide you with this 5 days before hop starts. * Your giveaway cannot have more than 10 possible entries total. This is done for a reason, studies show giveaways with more than 10 entries turn away people from wanting to enter. If you cannot abide by this rule, then this hop isn't for you. I was a little less strict on this rule last year, but this year it will be enforced. However, I do allow *tweet once a day, or pin once a day, comment daily, entries since they will help grow your blog and get the word out on the giveaway hops. * NO CAPITCHA or WORD VERIFICATION allowed during the giveaway. If you use these, you must turn them off for the duration of the hop. The reason being, they turn people away and make impossible for some people to enter. You can turn it back on after, but it is not allowed during the hop. * You must have your giveaway post up live no later than 10am EST on the day the giveaway hop starts. You're giveaway must start on the date specified for each hop and run for the entire length of the hop, and end midnight on the last day of the hop. * You need to be willing to promote your giveaway. Or have a quick link to your giveaway on your blogs homepage for the duration of the hop. If you blog often it will get buried, if everyone does this and everyone promotes their own. It will just bring more success for everyone participating in the hop! * Your giveaway item must be related to the type of hop. Books, gift cards are always okay. But you cannot give an item away that requires someone to purchase something first or is a coupon to get a percentage off or anything along those lines. * When you sign up, please decide if your giveaway will be International or US only and indicate it next to your name with INT or US. If you don't include anything yours will automatically be edited to be US only. * You are responsible to acquire your own giveaway/sweepstakes prize. You are also required to ship the prize to the winner. If you are working with a company, you are responsible to work with them to ship this to the winner. * Giveaway item should have a value of at least $10. You are allowed to do multiple giveaways with your post, however the 10 max entries still applies. * You are required to create a giveaway post that is clear to your readers on what you are giving away and how they should enter. HINT: Keeping it simple and easy to enter will likely bring you more entries. * If you change your mind and cannot run your giveaway. Please let me know 24 hours before the morning the hop. I will remove you with no questions asked, and I will appreciate the advanced notice! * You join on the linky above. * You then add the giveaway dates to your calendar. * Then make sure you add my email to your contact list so it won't go to junk. *5-7 days before the giveaway hop starts you will receive an instruction email. This email will include the hop image. The HTML code and a short list of instructions. This way for those who like to create posts in advance so you don't have to leave it until the last minute. You will have all the details to do so. * 10am the morning of the hop myself and the co-host will go through the blogs to make sure everyone is playing by the rules. As well as have their posts up. Anyone without a giveaway post starting that day or anyone missing the image or blog list or not playing by the rules, will be removed from the hop. You will have 24 hours to notify us if you get your post fixed or up. After 24 hours, you will not be able to be added back into the hop. We will also make sure we change the linky link to go directly to your giveaway post. * It will be your job to check you're blog name Linky later that day and make sure it is clicking through correctly. Notify us of any problems and we will get this fixed as soon as possible. If you don't see your name on the list, email me and find out why. Have additional questions, just ask! Want to Co-Host a giveaway Hop? I am always on the lookout for bloggers who are interested. You must be willing to promote the hop sign up, the 3 weeks leading into the hop. Using your blog and any social media channels you have to help spread the word. You'll need to be willing to attach the giveaway image on your side bar for the sign up, and the duration of the hop. You'll have the choice of linking it up to this sign up page, or you may also create your own. During the giveaway hop, you need to be willing to help promote and get the word out for others to enter. Great! I am glad to have you join up! Glad to have you sign up with us! I think it will be fun! I've never done a hop before but I really want to join this one! I'll link up my info tomorrow! We'd love to have you join us Sharon! I love giveaway hops - I'm happy to be able to participate with you all!! Great Gigi, you should have your email now with the details to create your post. Thanks for joining up! Yay, I'm excited for the next giveaway. This first one was a lot of fun! Thanks Stephanie! Glad to have you join up again! Sounds like a great idea! I have a few coming up in January, but I might check this out for Feb! I'm not running one in Feb, but I will be hosting one in March. You are welcome to join up with any of them! I have a giveaway coming up in January too, so I will consider joining the hop! It should be fun! It was a lot of fun last time, and turned out pretty well for everyone:) If your interested we'd love to have ya join us! I'd like to participate. What do I need to do next? (newbie). We'd love to have you! First step is just enter your blog in the link above with the others. Then you have between now and 1/16 to come up with a giveaway you'd like to run on your blog. I'll email you the codes and picture for your blog about a week leading into it, so you'll have plenty of time to get your post scheduled in advance. If you have any questions, just let me know! Thanks for joining up, we are happy to have you! Great idea! I'll give away one of my Train Like a Girl tank tops! What an awesome giveaway item!! Thanks for linking up! Great idea! I've never done of these these so I am excited about it. Thanks. I'm glad you decided to join with us, they have been a lot of fun! Super excited about the hop! I had a lot of success with the last one. Question: I thought I saw something about a minimum value for the giveaway prize, but I'm not seeing it here. Am I confusing it with something else or missing it here? Hi Sharon, I am glad you had lots of success with the last hop! I enjoy these - I signed up. Great, we are excited to have you join us!!! You'll get the instruction email with the link by tomorrow morning, just in case you want to work on your post in advance:) Thanks for linking up! How Do I Sign Up? Yes I would be willing to co-host. You can sign up above by listing your blog in the Linky, we'd love to have you join us! I will keep your information and contact you in future months to co-host a hop with me, thanks for asking! Definitely want to be involved again! I have emailed you about hosting and a few other things in the past--did you get any of them? I'm interested, but I have no idea about how to use rafflecopter, having never done it! How difficult is that? I think I can figure out the rest. I just emailed you. Rafflecopter is easy to use. But you don't have to ise it, you can capture your entrants any way you would like. We would love to have you join us, we hope you do!!!! Let me know if you have any other questions. How hard is it to use rafflecopter? I've never done it & am a bit scared; I think I can get the rest of it! I'd like to do this! But since my blog is fairly new I'm not really sure how much interest I'd get in a giveaway, plus not even sure what to put up :0 I will look more into the details when I have more time, and hopefully get some ideas of how to get involved. I love your blog networking opportunities! I'm so excited to enter...actually I was so excited when I signed up that I messed up my entry and put my url in instead of the title of my blog! How do I edit it?